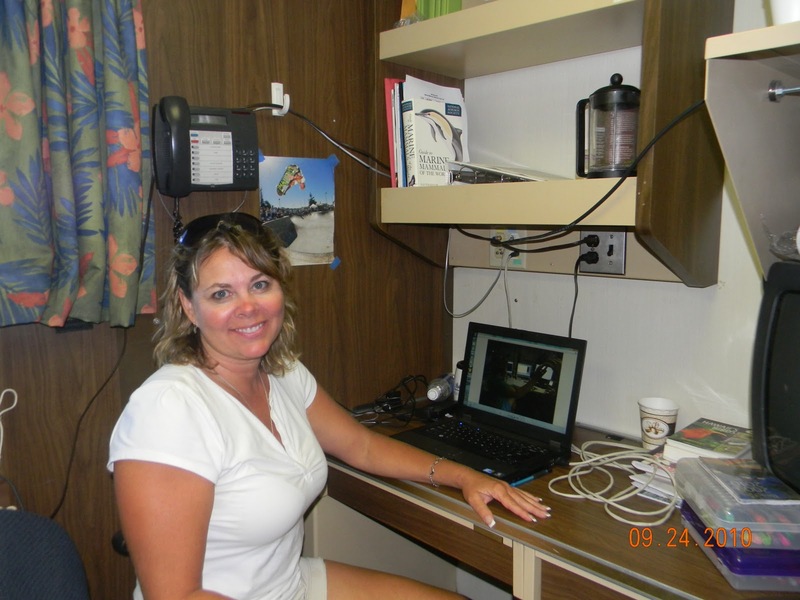 I am in the stateroom writing. Erin, Sussanah, and Kim working on the array. Of the five senses, hearing is the most important sense to cetaceans. Sea animals depend on hearing to feed and communicate. In water it is impossible for whales see long distance, their sense of smell is not as developed as in sharks, their sense of taste and touch will not help in traveling through the water seeking food, so therefore the sense of sound has become the most developed. Cetaceans whether odontocetes, the “toothed whales” such as the sperm whales and dolphins, or Mysticetes, the baleen whales such as the Bryde’s or humpback whales, have different ways of producing sound. Because their methods and mouths are different, different kinds of whales produce different kinds sounds with varying frequencies. Frequency is the number of waves or vibrations that pass a certain point in one second. People have a hearing range of approximately 150 – 20,000 Hz. Hertz or Hz is the unit for frequency meaning how many waves are reaching a destination in one second. People talk within this frequency range and can hear slightly above and below this range. Cetaceans have a much broader frequency range. The “toothed whales” produce rapid bursts of high frequency clicks and whistles. Their hearing range is 250 – 150,000 Hz. Single clicks are used for echolocation and a collection of clicks for are used for communication. Erin, Sussanah, Yvonne, Nicky and Kim checking the connections. 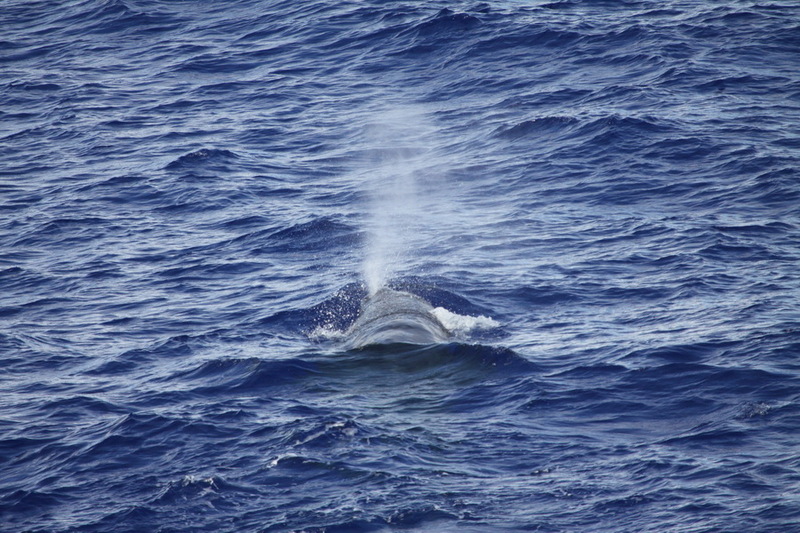 The baleen whales have a lower frequency range of about 10 – 31,000 Hz. They too use sound for echolocation and communication, but the “whale song” often associated with humpback whales is primarily for sexual selection. When comparing whales to other land animals, they even have a higher frequency range than dogs or bats. The bat has a hearing range of 10,000 – 100,000 Hz and the dog’s range in 15,000 – 50,000 Hz. In whales and bats the higher frequencies are used for echolocation. Another difference between the land and aquatic animals, is where their sound is transmitted. 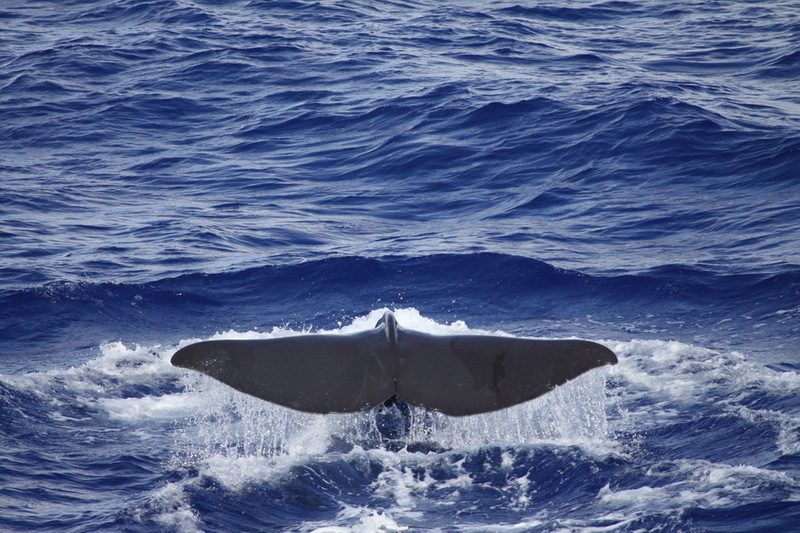 Land animals send and receive sound through the air and cetaceans do both through water. Sound travels almost four times faster through the water. That is the reason whale noises can travel thousands of kilometers. Whale noise is not the only noise in the ocean. People are making a lot of noise themselves. 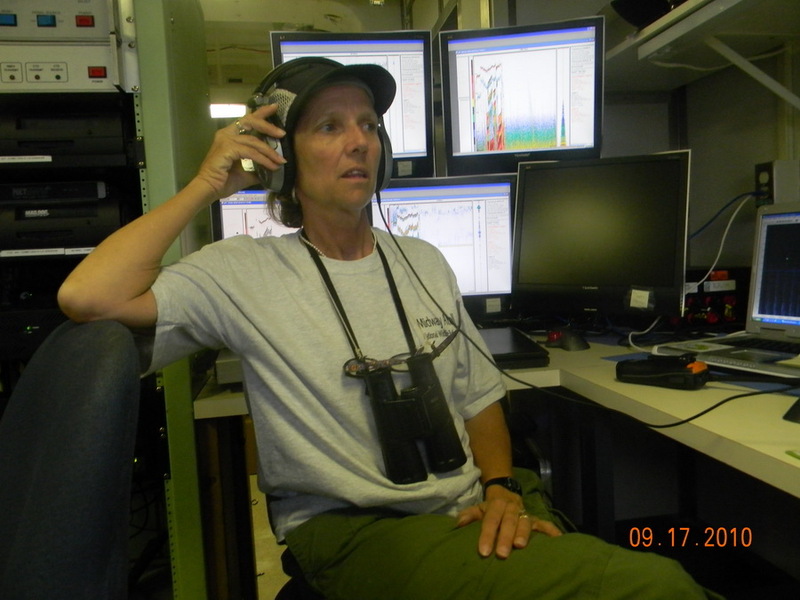 With increased noise from ships, sonar, and seismic surveys the ocean is becoming a noisy place. Environmentalists and cetalogists are concerned with the added noise. 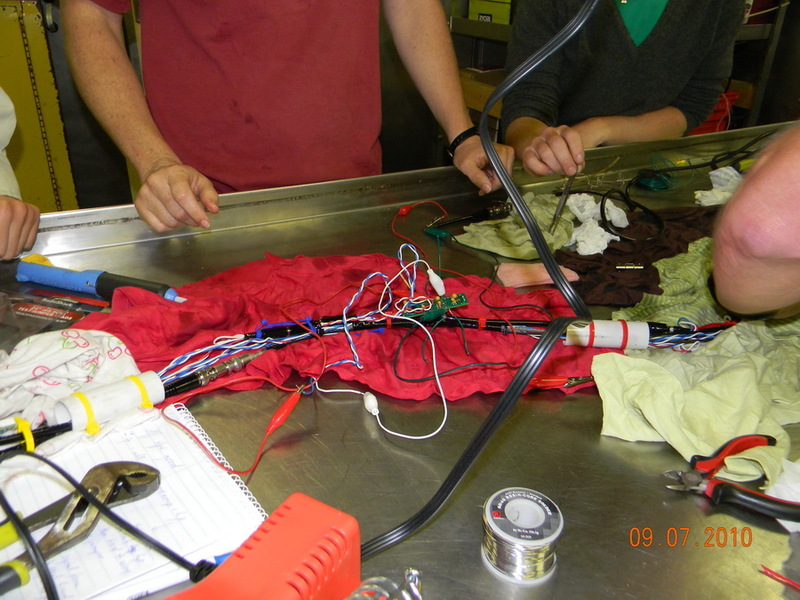 Noise may be one of the factors in animal strandings. The strandings may due to stress from noise, but in some cases cetaceans have had damaged ears. It is unknown if increased noise levels have caused the ear damage or it is only old age. This is definitely an area which could use more study. A group of sperm whales sound like the patter of rain. It has been through my observations aboard the Sette, the acousticians have a challenging job! They of course have a love of cetaceans like all marine biologists, and want to locate and study these animals, but they need to work with very sophisticated electronic equipment rather than be out on the flying bridge looking through the “big eyes”. If the equipment is not designed properly, whale and dolphin sounds cannot be detected. 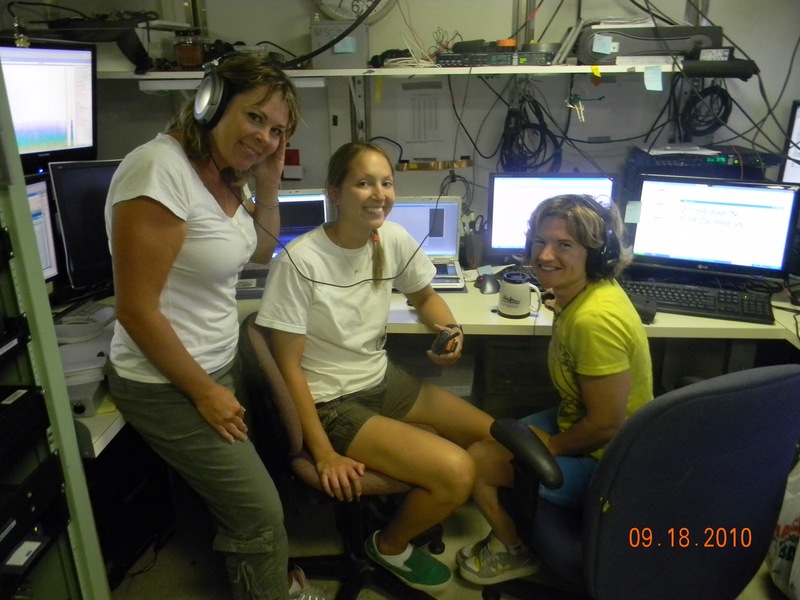 Yvonne, Sussanah and Nicky are the acousticians on the ship. These young women have had additional adventures over and above others on the cruise, and adventures that they would probably wish they didn’t have to experience. I am very impressed with their trouble-shooting abilities, their patience and their tenacity! Each dot is a click, every color is a different animal. 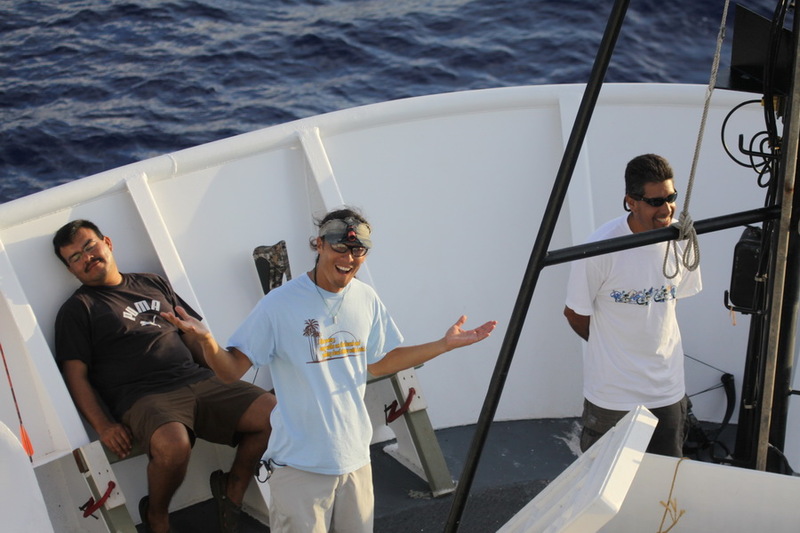 At the beginning of the cruise the acousticians were gifted with a brand new array! An array is a long clear soft plastic tube containing all the electronic equipment needed to absorb and transmit sound to the sound equipment back in the ships lab. The array had (notice I said had – past tense) hydrophones and transmitting boards throughout its 50 foot length. In order for the sound to travel through the water and be received by the array, the entire electronic circuitry inside the array needed to be immersed in a liquid similar to salt water’s density. If the electronics were exposed to sea water there would be too much corrosion for the system to work properly. So, they chose a colorless oil to fill the array. The array is laid out on the fantail (back deck) bridge and is connected to a spool of power and relay cords (ok, you realize by now I know virtually nothing about electronics) and then the cords are slipped into the lab and connected to the sound equipment. I know that last part for certain, because I helped Nicky wire tie them together at the beginning of the cruise. Dawn listening to the sperm whales. When the array was (yes, still past tense) lowered into the water behind the ship, it was 300 m back and 6 m deep. It needed to get a long way past the boat, so the boatnoise wasn’t the only thing heard. 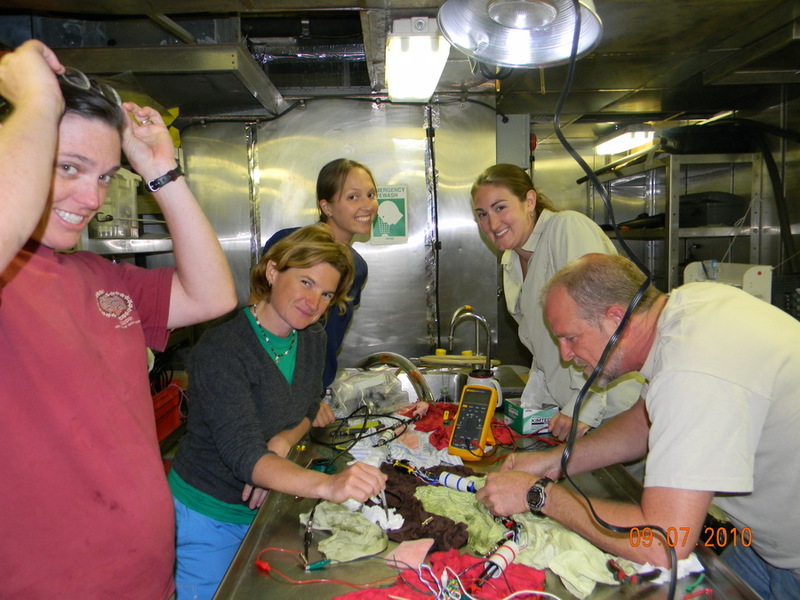 Unfortunately the acousticians could not pick up the normal ocean sounds and animal clicks that they have become accostumed to on past cruises.They looked at the inside equipment, took out boards, tested solders, and electrical power strips. They checked out the transmitters, connections and screws. (They reminded me of the Grinch not overlooking one last detail!) Still the blasted thing did not work. I hate to admit that I shyed away from them for a time, because all the help I could provide would be in giving inspirational clichés, and I know they had enough of those already. Eventually, enough was enough and even though, and yes remarkably so, they were in good spirits, time had come to take the array apart. 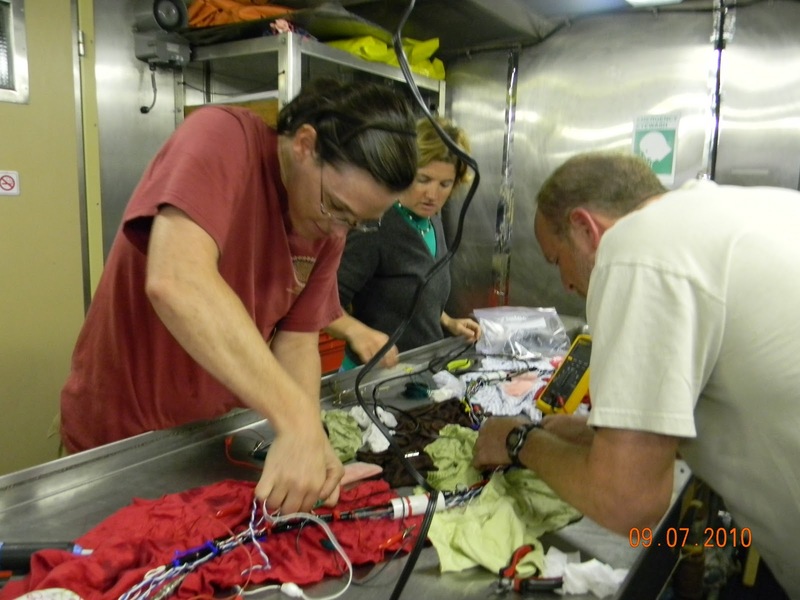 Erin was there to assist, and Kim the Sette’s electronic technician was working side by side with Sussanah, Nicky and Yvonne. They gutted the whole thing, oil and all. Then they checked the mini-microphones and relay boards. I was very impressed! You could hear the sperm whales loud blows. All was done that could be so it was decided to put it back together, and try it again. It worked! I wasn’t surprised but rather amazed! Unfortunately two of the four hydrophones stopped working. Each hydrophone picks up different frequencies so if they don’t all work. The array doesn’t work. Drat! Not to be overcome with minor setbacks. (Minor to them, I’m thinking definitely Major if I had to work on it!) The acousticians set to work making an entirely new array! 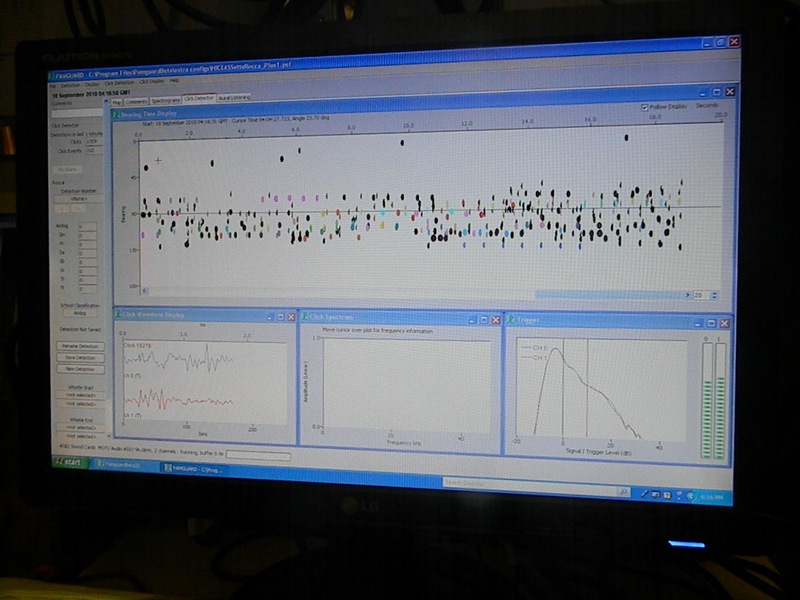 One day I decided to stop down in the lab to check things out and see what new adventures they were presented with. As Sussanah sat and stripped wires, I asked Yvonne and Sussanah how much electronic background they had to have for this job because I was clearly impressed. Neither of them has had any classes, only the experience of working on similar equipment in the past. 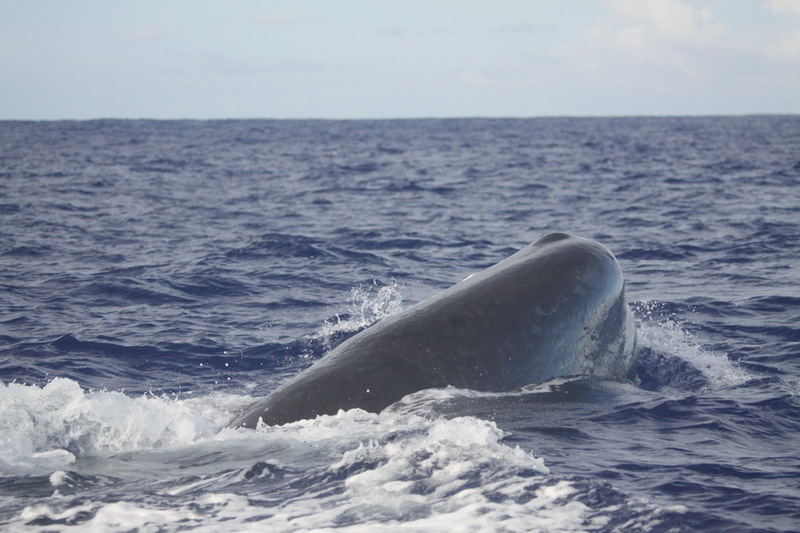 Sperm whales use echolocation to find food. This is what you see before they make their vertical dive. None of them had an electronic background, but they decided to make a new array themselves with the left-over parts. They were determined to become an active part of the survey team! And they did it! They built their own array! It was (yes drat, past tense again!) working great until one day it was getting progressively worse. When the girls pulled it in, they noticed it had been bitten! Some fish came up behind it and bit the newly fabricated array! What kind of luck was that! Salt water was leaking in. “How can you fix that?” I asked Sussanah at dinner. She said, with her British accent, (which is so much fun to listen to, and one of the reasons I like to ask her questions) the kevalar material inside the device, which is giving the new array strength and structure, is acting like a wick and soaking up the salt water. So they split the kevalar and it is being held together with a metal s-connector to try and stop the wicking. Ernesto, Adam and Juan Carlos gave a valiant effort. Unfortunately no biopsy samples were collected.